The Backwoods Engineer: It's Hittin' The Fan! Yes, folks, the bovine excrement is on a direct trajectory for the rotary oscillator's fanblades. 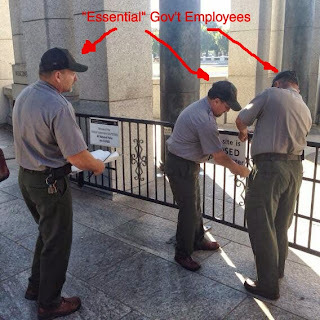 The Obamatrons put up more FedGov barricades in front of the WWII Memorial this morning, knowing full well that a group of Honor Flight Vets from Kansas were on the way. Hilarity ensued. 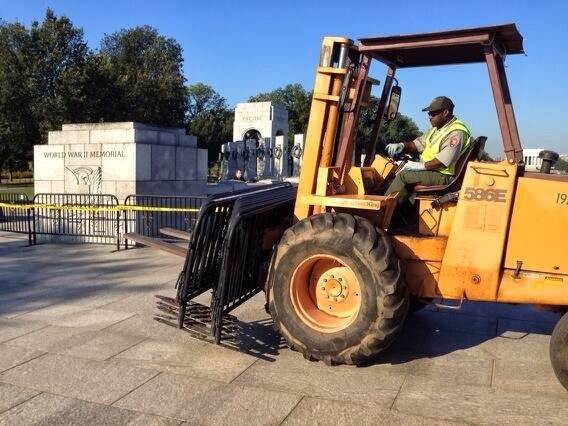 After the WWII vets (and even a National Park cop) crashed the barricades yesterday at the privately-funded WWII Memorial in Washington, DC, and even threatened to arrest them, the Community-Organizer-in-Chief decided to make vets even more mad by piling up more barricades and putting up more signs. Many of these vets are in their mid to late 80's. You don't want to get into a fight with someone who has nothing to lose. He might just have one more Battle of the Bulge left in him. The National World War II Memorial was funded almost entirely by private contributions, as specified in Public Law 103-32. The campaign received more than $197 million in cash and pledges. Support came from hundreds of thousands of individual Americans, hundreds of corporations and foundations, veterans groups, dozens of civic, fraternal and professional organizations, states and one territory, and students in 1,200 schools across the country. This is the question that Republican federal Representatives are asking, too. 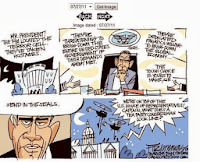 A good one from Free Republic article linked above. Free Republic: "Rep. Louie Gohmert on Fox News just now saying he is heading this minute to the WWII Memorial to help lead a Congressional "inspection" of the memorial aided by WWII experts: Honor Flight vets from Kansas." Outstanding. I am praying for a showdown. The optics of this, out in the heartland, are very bad for Obama, but he is too dense to understand what "bitter clingers" like me are thinking. UPDATE: we got a showdown, all right. Two park rangers now guarding the gate saying "we are here to protect the memorial and the resources." ... Park ranger will not answer questions about arresting vets, says "that is an enforcement issue." Hey, if these vets get too outta hand, he might go all Bonus Army on 'em, and deploy the cleanup crew... or just pop 'em Boca Raton style. UPDATE: WWII Honor Flight vet now in charge of admittance, per Ben Johnson. Never forget this moment. This is how Barack Obama acts, when challenged or resisted. He acts ugly, and mean-spirited, and shabby. Yep. So what else is new? On with the rest of the news of the day. Yeah, there's a lot of "Boooosh" bashing in this article, but a lot of it is deserved. nce JSOC took charge, the mission would no longer resemble anthropology. It was to be a manhunt, at times an assassination machine. I guarantee you, the federal police are being trained to be the same thing: assassins. Otherwise, why all the guns and billions of rounds of ammunition for previously-innocuous federal agencies such as NASA (! 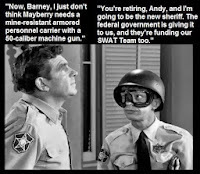 ), the Social Security Administration, and the EPA? We cannot continue to rely only on our military in order to achieve the national security objectives that we've set. We've gotta have a civilian national security force that's just as powerful, just as strong, just as well-funded. The Department of Homeland Security responds to the governor’s request by asking for defense support to civil law enforcement. After the Department of Justice states that the conditions in Darlington and surrounding areas meet the conditions necessary to invoke the Insurrection Act, the President invokes it. It's just a matter of time. Get out of these hives of government control. Come and take mine, EPA. Whither Duplexed Magazines in the AR-15? BRACKEN: Will Obama Stop the Music This November?